Our planet's rain forests - rich matrices of life which exist primarily in tropical regions - provide us with unique opportunity to observe life in all of its manifold and perplexing beauty. Most rain forests date back some two to three hundred million years. This extreme age has allowed many unusual and complex relationships to develop among the inhabitants of these tropical ecosystems. On occasion one of these ants, while looking for food is infected by inhaling a microscopic spore from a fungus of the genus Tomentella. 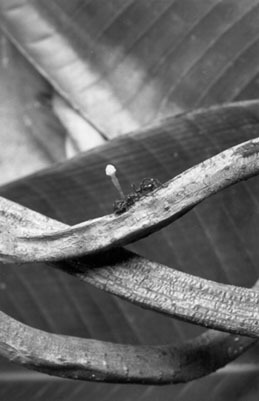 After being inhaled, the spore seats in the ant's tiny brain and begins to grow, causing changes in the ant's patterns of behavior. The Ant appears troubled and confused; for the first time in its life the ant leaves the forest floor and begins to climb.